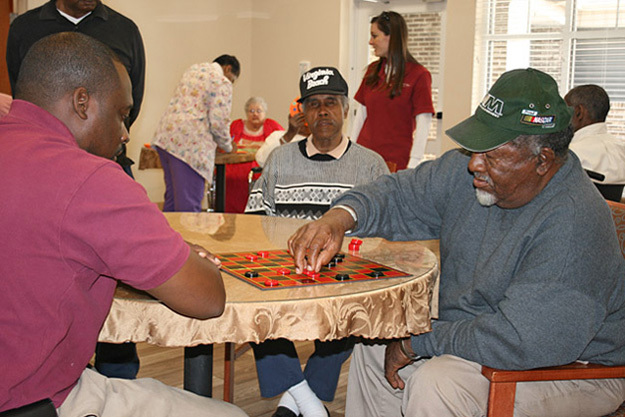 A wide variety of therapeutic recreational activities is directed by Cheraw Healthcare's activity personnel. An individual activity plan is developed for each resident to meet his or her recreational, social, physical and religious needs. Activity staff and community volunteers provide both “one on one” and group activities. Books, magazines, newspapers, games, TV’s, radios, tape players, DVD’s, writing materials and craft supplies are provided for our residents to enjoy. Cheraw Healthcare also offers wireless internet throughout the facilities for residents, families, and visitors. Many volunteers are utilized to assist with activities provided for our residents. Occasionally, the facility may charge for entertainment and social events that are outside the scope of the activities programs. We would like to know if a resident has a special interest, and if so, please inform our activity personnel.